The 7.62mm NATO M240B/General Purpose Machine Gun (GPMG) is a very reliable, fully-automatic, gas-operated, disintegrating link, belt fed, air-cooled, crew-served weapon. It fires from an open bolt and features a quick change barrel with fixed headspace. The M240B is the US Infantry version and is equipped with a buttstock, folding bipod, forestock and multiple M1913 Picatinni rails for mounting optics, laser illuminators, and accessories. 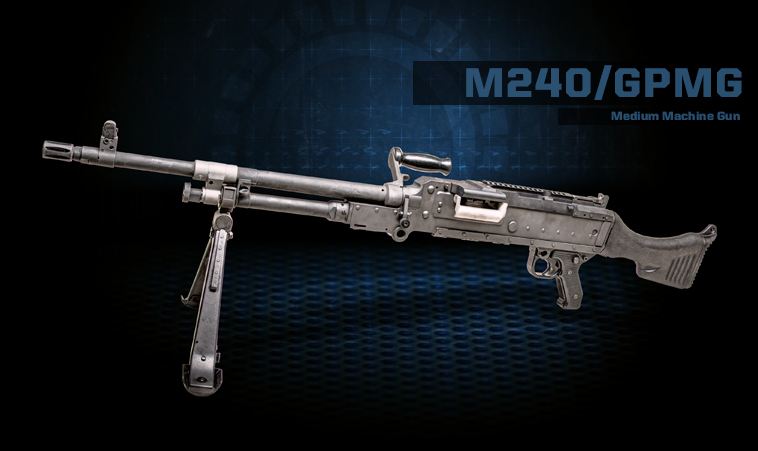 The M240B provides accurate and effective sustained rate of fire required to suppress and destroy enemy soft targets. Gas-operated – Recoils with gas-assist boost. Three gas settings to maintain a consistent rate of fire. Positive Locking of Bolt Body – Firing pin is part of bolt and operating rod assembly, and cannot strike primer until bolt is fully locked. Fires from Open Bolt Position – Prevents explosion of cartridge (cook-off) after prolonged firing. Can be configured for Left or Right Hand Feed. US Ordnance parts interchange with existing M240 and GPMG equipment in customer inventory. Compatible with all existing M240/GPMG mounts and tripods. The charging handle guide is machined into the right side plate which eliminates receiver breakage that occurs with older riveted design. Surface treatment on bolt locking lugs provide extended receiver service life. Optional Stellite®-lined sustained fire barrels for extended barrel life. Hydraulic buffer system available by request. Forward M1913 accessory rail by request.